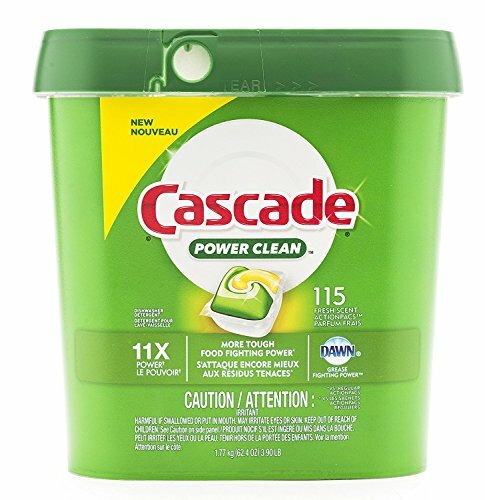 Cascade ActionPacs power away greasy residue for sparkling dishes in one easy-to-use pac. ActionPacs combine the scrubbing power of Cascade dishwasher detergent and the grease-fighting power of Dawn to leave your dishes virtually spotless with a brilliant shine. Formulated with built-in rinse aid action plus water softeners to help prevent hard water deposits on glasses, ActionPacs dissolve in your dishwasher to leave virtually no mess-only sparkling dishes. Simply load your machine, pop in Cascade ActionPacs dishwashing detergent, and go! Palmolive Max Power Pots and Pans Dishwashing Liquid, 1 Gallon - 4 per case.